I just got this great coloring set from Life In Coloring. I have to preface this with the information that I love the new coloring for relaxation fad. As a licensed counselor I am a huge supporter of this new trend. I also suffer myself from anxiety and sitting down to color is a great way to clear the mind and reduce stress. This set is really nice. You get a leather portfolio that is really well made. Has a fastener so you can keep it closed when you are not using it so things do not fall out. Inside you have a set of 10 colored pencils that comes with the set. They are nice pencils with a cool design. They are black except the color at the tip. These are all secured by bands inside the portfolio that keeps them in place. There is a zippered pouch that has a sharpener included. You also have room to put other items. I usually put my eraser and sometimes some pens. It also includes a coloring book. The book has a variety of pictures, very intricate so great for adults. The things I love about this book is that it opens at the top not the side like a regular book so you don’t have to struggle with getting to the parts of the picture close to the spine of the book. Pages are printed on one side so you don’t have to pick which picture to color. Printed on great quality paper. This is a very nice set. Plus you can remove the book when you finish it and put in a new one. I also have some coloring books I downloaded free on Kindle so this is a great way for me to store the loose pages. It’s a great set! Also makes a great gift! NOW with UPGRADED vibrant pencils! The secret is out and Coloring isn’t just for kids anymore. Join millions who have discovered coloring as a relaxation and stress relief exercise. Adults, young adults and teens all benefit from coloring and doodling and will love and treasure this art kit portfolio. Studies have shown coloring activates both logic and creativity. Relax your mind instantly with coloring. 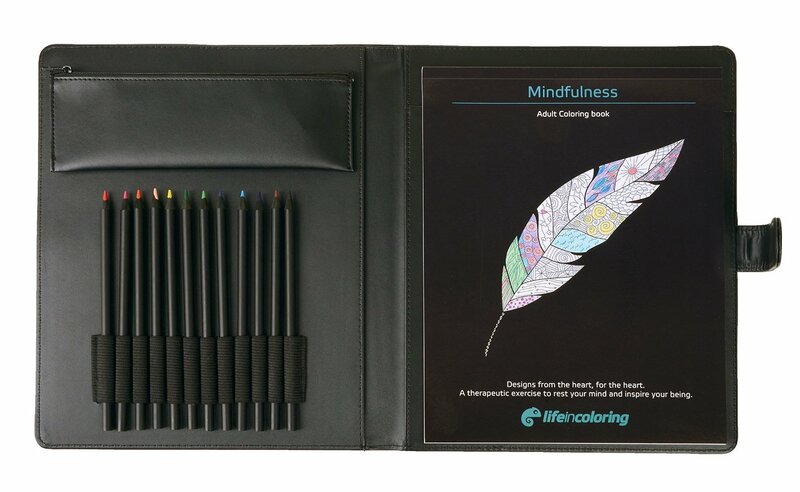 Encased in a leather like portfolio with magnet closure, this convenient complete coloring kit features original, limited edition, “Mindfulness” coloring book MADE IN USA on quality paper. Included is also 12 colored pencils, a removable pencil case and plastic pencil sharpener. Please note these pencils are student grade and included for your convenience or may be replaced with your favorite pens, water color or gel pens. This adult coloring book features a variety of coloring sheet designs and coloring levels. Have your work in progress on the go! Coloring book includes mandalas, owl, feather, inspirational designs, geometric designs, thoughts and doodle pages, and hand drawn coloring pages, all created from the heart. This versatile package has universally sized holders designed to fit your current coloring books and coloring pages, sketchbooks, gel pens, watercolor pencils and current art supplies for your favorite hobby! Our coloring books flip up to be convenient for portability and for left-handed coloring enthusiasts! No need to love to draw or be an artist. Get back to the time in your life where simplicity was everyday! Just pick up your pencils and book and start your colorful creations! Don’t forget to buy one for a friend, family member, co worker, teacher, or….Encourage them to put down the technology! Best Heartfelt Gift for 2015! Best new Hobby!